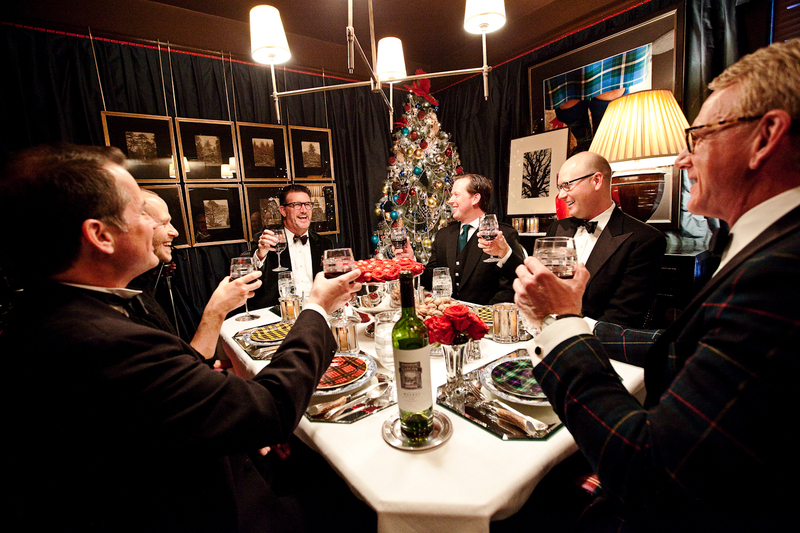 the adventures of tartanscot™: "Designing Your Holidays, with Scot Meacham Wood . 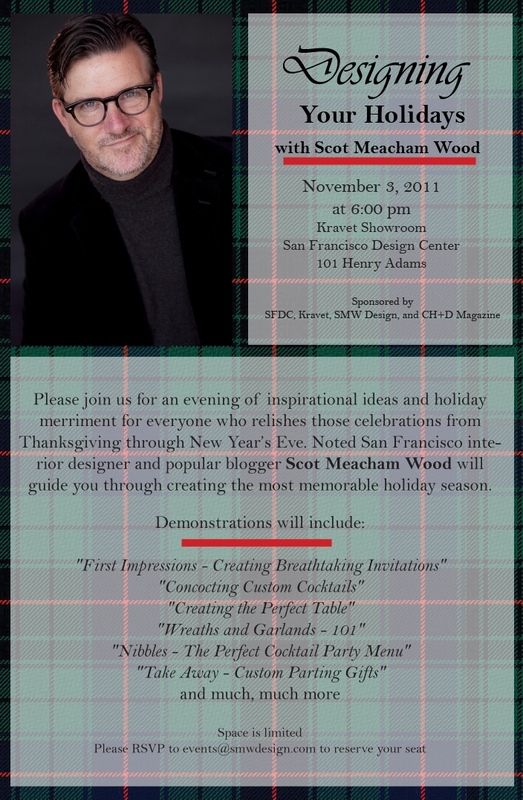 . . "
"Designing Your Holidays, with Scot Meacham Wood . . . "
Well. We've got some BIG news to share today here at SMW Design. 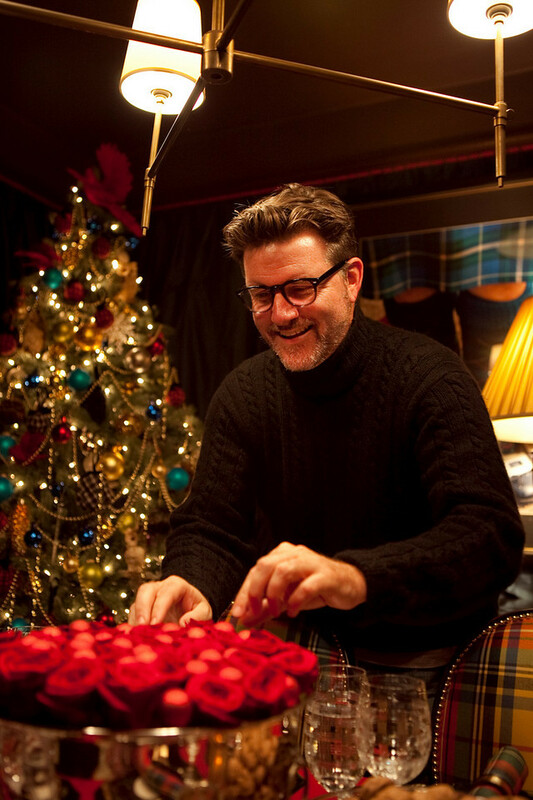 Many of y'all will already know my passion for decorating and entertaining during the holiday season, and with that in mind - I'm pleased to announce an evening of presentations and inspirations - "Designing Your Holidays, with Scot Meacham Wood." Please join me - November 3rd at 6pm - at the Kravet Showroom here in the San Francisco Design Center. Let me extend a big "thank you" to Lisa Davis (of Kravet, San Francisco), Rhonda Hirata (from the San Francisco Design Center), and the entire staff at California Home & Design Magazine for all their assistance in putting the evening together. If you love the holidays as much as I do - we're going to have an amazing evening together! Keep in mind that seating is limited - so RSVP at events@smwdesign.com to reserve your place. I am so jealous of all those that will be able to attend, unfortunately for me I am on the east coast. Is there any chance you will be doing something like that here? I love your home, your style and your love of tartan and Christmas! Oh - I wish I were closer, Scot! I'd be there in a heartbeat! Good luck, and perhaps share some of your best tips here for us, k? Scot!!!! You must come to NYC next year and do this! Who do I need to beg? Now, what's really weird is that I have been having Mad for Plaid visions for weeks. I think I simply MUST host some type of tartan plaid party. So, this week I had revisited your Rue party for ideas. And, now here you are with this. Another sign? I think so! Please share a few things online after the event!!! Sounds wonderful, wish I could be there but the journey from Wales may be a little too long. Any ideas for decorating for Christmas on a boat? Good luck with your evening, I am sure it will be splendid. Wish I could join you. While we are at it Scot, your new pictures are very nice, could you not replace the one on your blog heading with this one made for the announcement? Boy do I wish I could just jump on a plane for this! I still fondly remember your decorating contest last and hope you are planning another this year. Not to mention how high you set the bar with your own beautiful decorating, I just loved it! Boy that sounds like fun, so wish I was closer!! Love that last picture, its the essence of holiday style and elegance....beautiful! Scot this is great. You know how much I love the way you entertain. Alas, Im thousands of miles away. "The San Francisco Fall Antique Show . . . "
"In Bed With . . . "
"Sunday Runway. Men, in Motion . . . "
"Getting Ready . . . "
"And the winner is . . . "
"Sunday Runway, Hackett Fall 2011 . . . "
"A Book Give-Away . . . "
"Fall. In Love . . . "